If you are looking for that extra special, idyllic, waterside retreat, then Tanglewood House is for you. 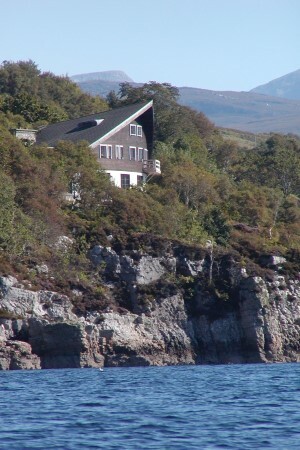 Within walking distance of Ullapool, this magnificent house sits in an elevated position on the shores of Lochbroom in over two acres of natural woodland with stunning panoramic views and private beach. Ullapool is a very popular holiday destination not only because of it's setting amongst some of the best scenery in Scotland, but it is the perfect base from which to explore the North West Highlands. Tanglewood House is a detached house with very spacious living and dining accommodation on the ground floor, and sleeping accommodation on the first and second floors. The curved design provides a sea view from every room, and internally there are many hand-crafted features including solid oak arch topped doors with Loire chateau moulded designs, herringbone ceiling panelling, a striking curved staircase and hand crafted kitchen units. 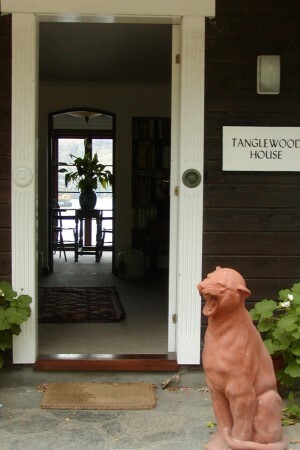 The main entrance to Tanglewood leads into a large hallway, off which is the drawing room with comfortable seating, large fireplace with inset wood burning stove, grand piano and large feature window giving excellent views of the loch, and hills beyond. The dining area is connected to the drawing room with a large arch and has ample room for dining, and has access via French Windows to the loch facing terrace which gets the sun most of the day, and from which you can sit and watch the world go by. The kitchen is well equipped and has a large table with chairs, offering another option for casual dining. Off here is a separate utility room with ample space for washing and drying, and giving access to the double garage. 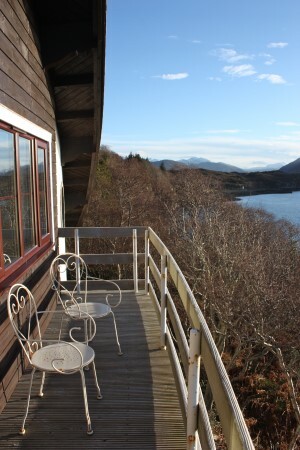 All bedrooms have TVs, en-suite with bath and shower, and have super loch facing views. Four are accessed from the first floor landing which is spacious and bright with large windows overlooking the front gardens. The master bedroom has a super king-size bed and small balcony. A spiral staircase leads to the very private upper level sitting area and into another very large bedroom with king size bed, and ample storage space. A small terrace with outdoor seating, runs the full length of the house and perfect for aperitifs or a dram whilst enjoying the views. A steep path takes you down to the shore and rocky beach which is perfect for barbecues and picnics, or even a swim for those hardy enough. A boat can also be moored in the bay. There is also a trampoline, sandpit, swing and children's bicycles available at the house. Tanglewood is the ideal retreat for outdoor loving parties, with many opportunities including fishing, stalking,hill-walking, mountain biking, a 9 hole golf course, and several sea trips and boat cruises. Ullapool has a very good leisure centre with a lovely 25 metre pool, small gym and many dry side activities seven days a week. 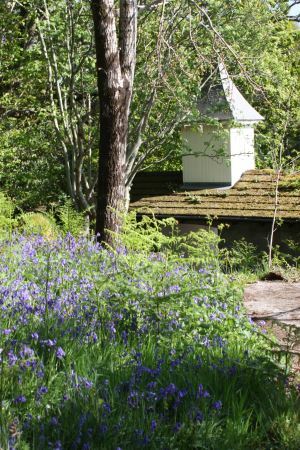 Please note young children should be supervised as there is a steep woodland garden to the loch. Entrance hall, drawing room to right, and conservatory beyond. Dining room. Kitchen, w/c utility, garage. Stairs to first floor. Landing off which are four bedrooms, spiral staircase to second floor.